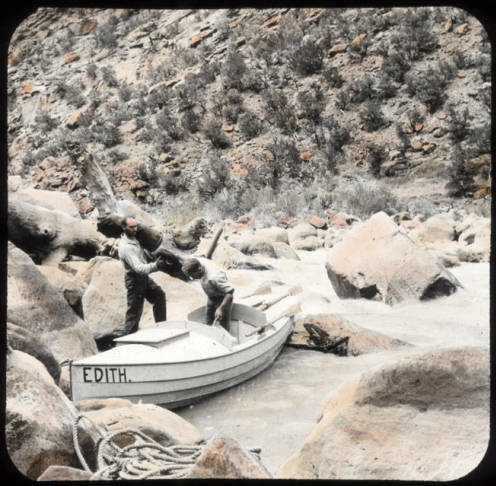 A description of the Kolb Brothers’ experience river-running the Green River through Lodore Canyon in late September, 1911. 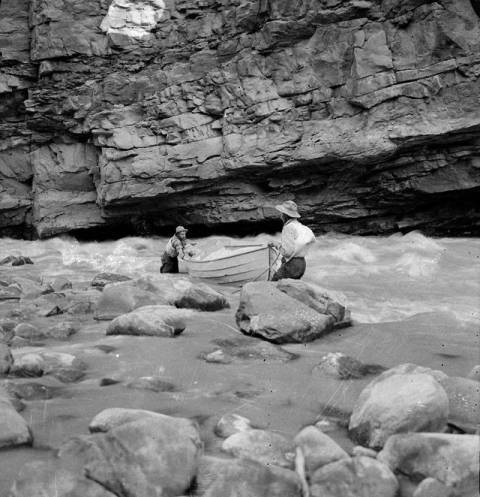 In Lodore Canyon Emery and Ellsworth Kolb quickly learned that a wild river made for a perilous journey. The Green River in this section is noted for its narrow channel, abundant boulders, and difficult rapids. 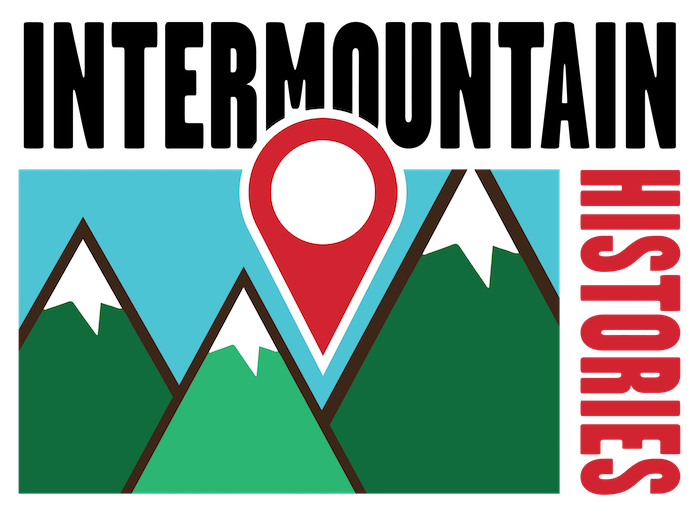 Dropping 420 feet in twelve miles, the hydrologic forces funneled through this cut in the Uintah mountains are immense, measured at 9,000 cubic feet per second. At any moment, their wooden boats, laden heavy with supplies, were subjected to a force comparable to releasing five Olympic-sized swimming pools into a typical bedroom. Not only did several hundred rolls of motion picture film add weight, they were a logistical nightmare as they had to be kept secure and dry. The brothers hoped this added burden would pay out in years to come with a motion picture and photography show covering their exploits. The cold and rainy weather added to the difficulties of the trip. The arduous task of filming the journey compounded the typical trials of an already challenging whitewater expedition. 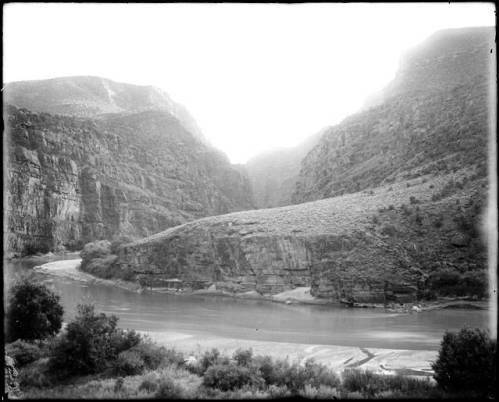 On September 22nd, 1911, Emery and Ellsworth entered Lodore Canyon, a remote and rough stretch of river. The next day Emery’s boat, The Edith, struck a boulder and began filling with water, forcing them to unload supplies and make an emergency camp. Discouraged by the blunder and damaged plates, the brothers lined their boats —pulled them by rope— down Lower Disaster Rapid. Considering the canyon is only twenty-one feet wide and the river drops fifty feet into an undercut bank, Emery was probably correct in stating later in his book about the trip, that it “would be certain death to try and run it.” Disaster struck on September 27th, when the river pinned Ellsworth’s boat against a rock and ejected him from the craft as it filled with water. Their assistant, James Fagan, retrieved the soaked gear downstream while Emery rescued his brother. As they waited for gear to dry, the brothers tried their luck fishing. Surprisingly, the cold muddy Green sustained an abundant population of fish, and the trio reeled in fourteen in under half an hour. They needed those calories shortly, as the final and largest hurdle in Lodore lay just around the bend; the notorious rapids of Triplet Falls and Hell’s Half Mile. Despite wisely choosing to line their boats and portage their gear through this stretch, it was by no means easy. In the depths of the 2,800 ft. gorge, it took them nearly three hours, nine trips, and a 100-foot climb just to move The Edith and its gear. More rain followed, leading Fagan to break down in tears. Having successfully negotiated their first test of will power and technical skill, Ellsworth and Emery proved themselves to be competent rivermen. The fruit of their labor was the finest and earliest film ever produced of Lodore Canyon, and confidence that would be necessary for the many miles ahead. 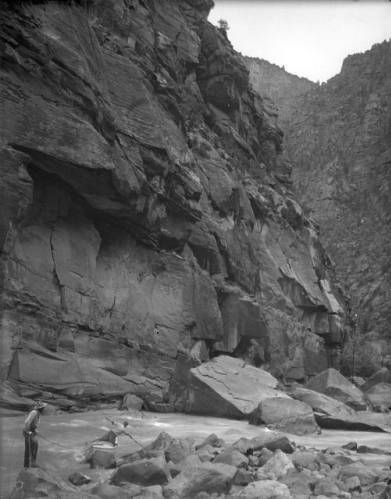 For inforrmation Lodore Canyon, part of Dinosaur National Monument, visit https://www.nps.gov/dino/planyourvisit/gatesoflodore.htm - Lodore Canyon, part of Dinosaur National Monument. 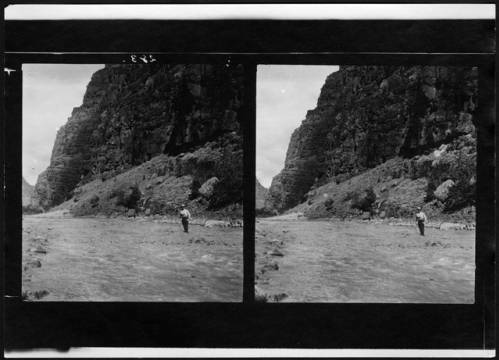 Jonas Dunlap, Northern Arizona University, “The 1911 Kolb Expedition through the Gates of Lodore,” Intermountain Histories, accessed April 19, 2019, https://www.intermountainhistories.org/items/show/67. Kolb, Ellsworth. Through The Grand Canyon From Wyoming To Mexico, New York: The Mac-millan Company, 1914. Kolb, Ellsworth L., William C. Suran, and Emery Clifford Kolb. The Brave Ones: The Journals and Letters of the 1911-1912 Expedition Down the Green and Colorado Rivers by Ellsworth L. Kolb and Emery C. Kolb, Including the Journal of Hubert R. Lauzon. Flagstaff, AZ: Fretwater Press, 2003. Sailor, Rachel McLean. Meaningful Places: Landscape Photographers In The Nineteenth-Century West. Albuquerque: University of New Mexico Press , 2014.